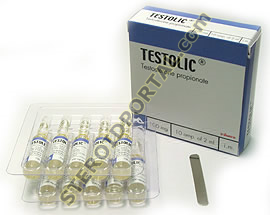 Testosterone Propionate (also being reffered to asâ test propâ) is probably the first produced steroid of its kind and sets the bar for other steroids to follow. Unlike other steroids, this has a totally balanced ratio of muscle building as well as androgenic (enhancement of male characteristics) effects, which means that is equally powerful in both aspects. Since most steroids are attached to ester molecules, the more esters a steroid contains, the less pure testosterone you will get as esters stay long on the body and then get wasted. For example testosterone cypionate contains 68mg of pure testosterone (apart from the ester part) whereas testosterone propionate contains 83mg, which means that you get more pure testosterone and androgenic effects comparing to testosterone cypionate for example. TESTOLIC overall helps build mass by supporting nitrogen retention, so that the muscles can accumulate more protein and become bulkier and stronger as well as boosting the levels of the growth hormone IGF-1 in the muscle tissue for added muscle growth. TESTOLIC, is also able to stimulate the production of satellite cells, which help speed up the recovery process and repair strained muscles, after working out hard. Other similar effects of TESTOLIC, include anti-catabolic effects which means that the steroid prevents muscle loss in the first place, something that can be an issue when you work-out extensively. Another positive side-effect of TESTOLIC is increasing oxygen supply to red blood cells. In general, TESTOLIC works in various ways to promote and maintain muscle growth. There are no major side effects that you should worry about, but, like most steroids, TESTOLIC may convert to estrogen (through a process also known as aromatization), and cause problems like enlarged breasts, liquid retention, and high blood pressure. To keep hormone levels stable (the hormone levels drop gradually with each injection), take 100mg every 3 days or every other day for even better results. We donât suggest that you inject teh dose only once a week as the esters in it make it short lived and you wonât notice any results. 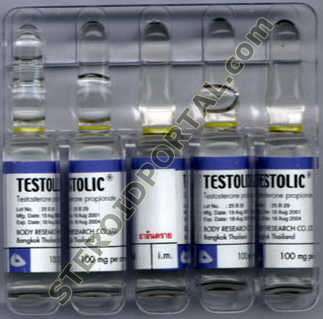 TESTOLIC has more pure testosterone inside which means more androgenic effects for you, however as this testosterone has a chance to convert to estrogen, itâs best to take this with steroids that inhibit this process so you donât end up with unwanted side effects like liquid retention for example.